The prestigious Quilt National competition began in 1979, in a dairy barn in Athens Ohio. Read more about how the exhibit has grown to be an important art quilt venue. All Quilt National artists consider themselves honored to participate in the “Academy Awards of Quilting”. Each Quilt National Exhibit awards a number of artists special recognition for their work. Read more to find out about the prizes and the lucky winners. Members of the Quilt National artists community show their artwork in venues around the globe. Read more to find an upcoming event near you. 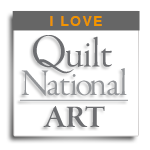 Quilt National Artists is a collaborative site dedicated to spreading the news about art quilts and fiber art. Each artist who participates on this site has been chosen to show in the prestigious biennial Quilt National exhibition. This website is a labor of love created by two Quilt National artists, Paula Kovarik and Leslie Bixel, who want to build a home for Quilt National artists on the web in order to promote the artwork and connect the artists in the community. All art on this website is owned by the artists and used with their permission. Please respect their copyrights. A complete archive of articles published on this website may be found here. If you are a Quilt National Artist and would like to submit a news article about and quilt national related topic or publish an up-coming event on the events calendar, please contact us by using the information below. Find out how to contact us at quiltnationalartists.com.